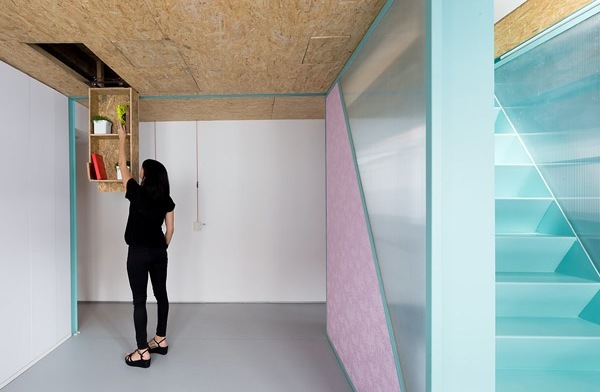 This Didomestic apartment by Madrid’s Elii Architects has been making the blog rounds lately. 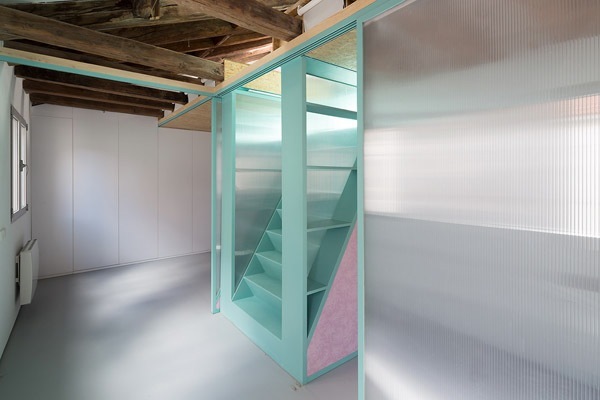 There’s a lot going on in the 620 sq ft converted attic. 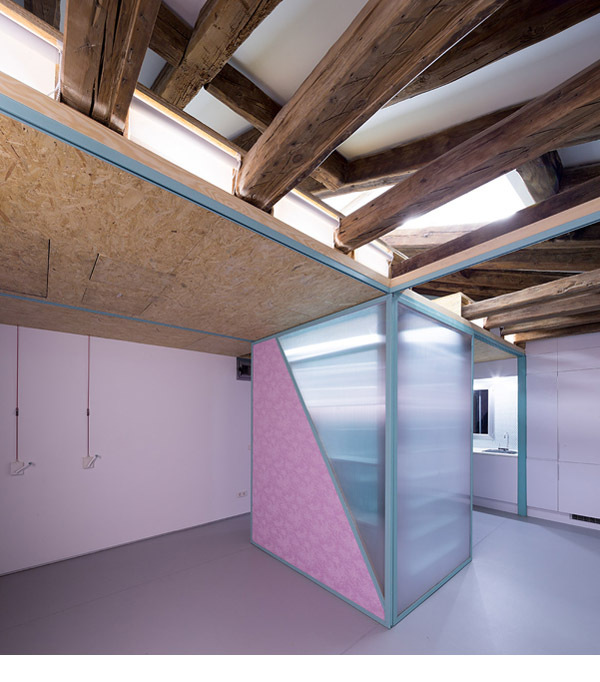 Much of the apartment’s furnishings can fully concealed in floor and ceiling cavities. 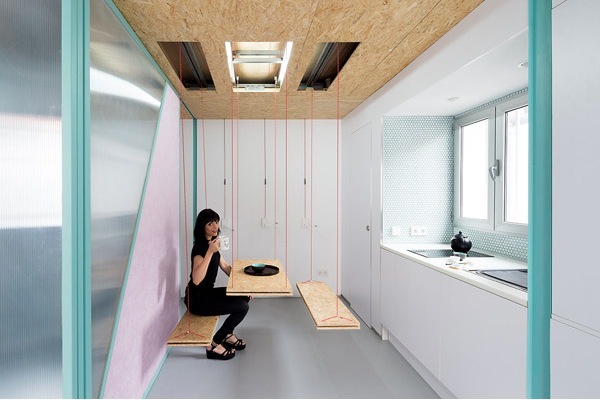 On the first floor, there is a dining table, benches, storage lockers, hammock, fans, hammock and disco ball that descend from the ceiling via pulleyed ropes attached to hand cranks. 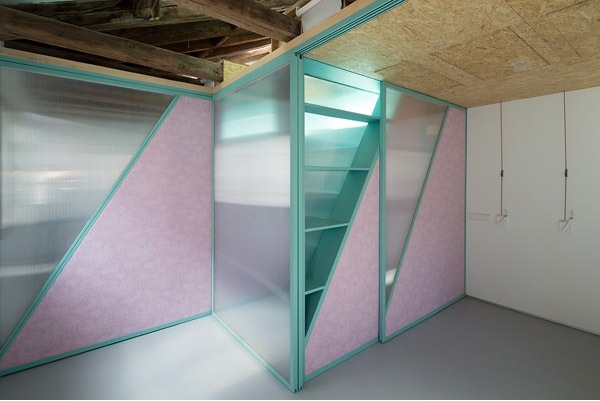 On that same floor, there are sliding pink partitions that allow the space to have several different configurations. 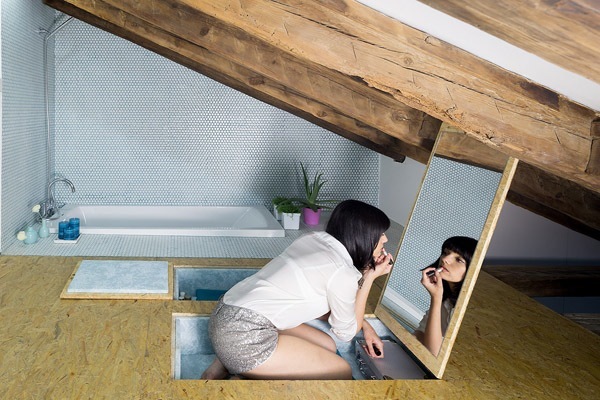 On the second floor, there is a seating cushion and vanity that pop up from the floor as well as a sunken tub. 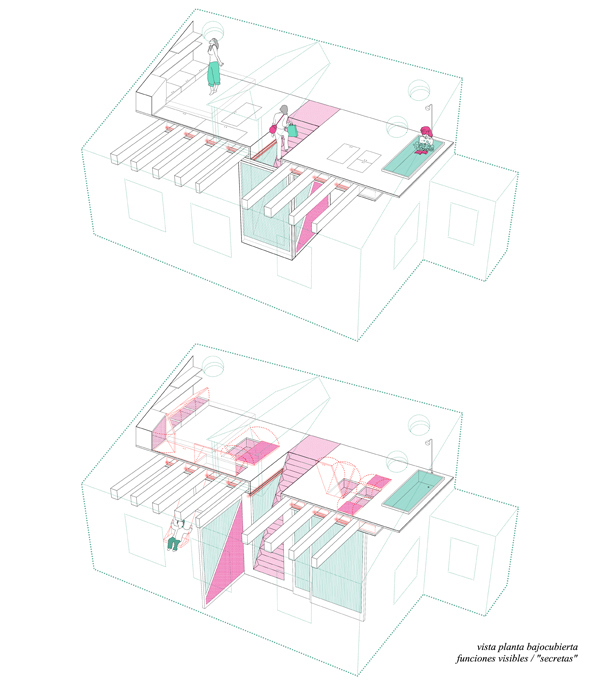 Elii says of the concept: “Every house is a theatre. Your house can be a dance floor one day and a tea room the next.” Check out this video to see the place move. We see lots of theater (and disco) in the Didomestic. What we don’t see as much of is house. We wonder how the space would actually be used. We suspect the dining table and benches would be unusable because of insufficient support (there’s a reason the models are stock-still while sitting at it). We don’t imagine anything useful would fit in the overhead storage. The floor-based seating would only be suitable for the most limber. 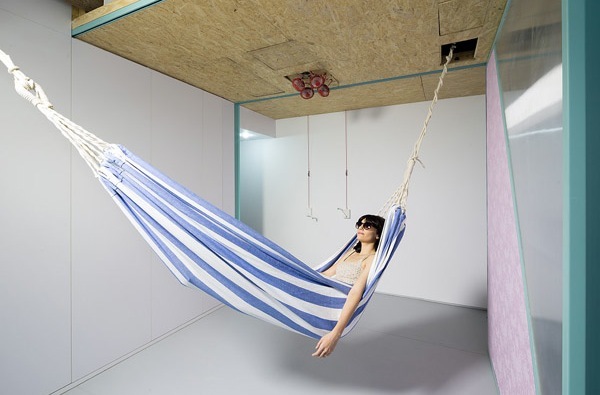 The swing, while novel, is a piece of furnishing unlikely to make its way into the interior design cannon. The lack of essentials like a sofa, while making the space “versatile”, also make it somewhat useless on a practical level. Of course the space isn’t necessarily going to look the way it does in the photos. After the owners add their sectional couch and Hummel collection, the place might feel quite homey. We love experimental spaces like these, as they push the boundaries of what people think possible. We do think that making some concessions to end-user functionality isn’t always a bad thing.